Negative coronary artery remodeling is frequent in patients with diabetes, but its mechanism remains unclear. We here evaluated the association of serum levels of glycated albumin (GA) and endogenous secretory receptor for advanced glycation end products (esRAGE) with coronary artery remodeling in type 2 diabetic patients. Serum levels of GA and esRAGE were measured and intravascular ultrasound was performed in 136 consecutive diabetic patients with 143 coronary intermediate lesions. The remodeling index (RI) was calculated as the ratio between external elastic membrane (EEM) area at the lesion site and EEM area at the reference segment. Negative remodeling (NR) was defined as an RI < 0.95 and intermediate or positive remodeling as an RI ≥ 0.95. Mean plaque burden at the lesion site was 70.96 ± 9.98%, and RI was 0.96 ± 0.18. Negative coronary arterial remodeling existed in 81 (56.6%) lesions. 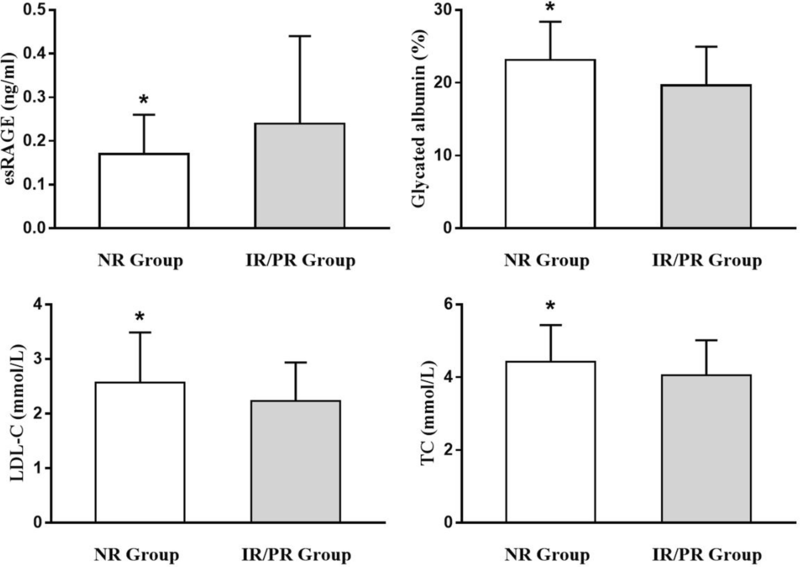 RI correlated closely with serum esRAGE level (r = 0.236, P = 0.005) and was inversely related to serum GA level (r = − 0.240, P = 0.004) and plasma low-density lipoprotein cholesterol (LDL-C) (r = − 0.206, P = 0.014) and total cholesterol levels (r = − 0.183, P = 0.028). Generalized estimating equations logistic regression analysis identified esRAGE (OR 0.037; 95% CI 0.012–0.564, P = 0.021), GA (OR 1.093; 95% CI 1.013–1.179, P = 0.018) and LDL-C (OR 1.479; 95% CI 1.072–2.835, P = 0.023) as independent predictors for negative remodeling. In diabetic patients, negative coronary artery remodeling is associated with increased GA and decreased esRAGE levels in serum. Coronary arterial remodeling (changes in vascular dimensions) occurs frequently during the development and progression of atherosclerosis, and is associated with clinical presentations in patients with coronary artery disease . Multiple underlying pathophysiological determinants for the patterns and degree of coronary arterial remodeling have been recognized [2–4]. Patients with diabetes are prone to have an early and accelerated course of coronary atherosclerosis  and exhibit a markedly increased incidence of adverse cardiovascular events and less favorable outcomes after myocardial infarction or percutaneous coronary intervention (PCI) [6–9]. Intravascular ultrasound (IVUS) studies have shown that apart from lesion progression, coronary arteries in diabetics, compared with those in non-diabetics, are typically described as smaller and more likely to be diffuse and undergo negative remodeling (when the vascular area decreased as plaque develops) . However, the exact mechanisms of negative coronary artery remodeling in diabetic patients remain not fully elucidated. Interaction between advanced glycation end products (AGEs) produced in hyperglycemic milieu and their receptor (the receptor for AGEs, RAGE) plays an important role in the development of diabetic vascular complications [11–15]. Activation of RAGE-mediated pathways could lead to a series of adverse effects including impaired vascular homeostasis, enhanced inflammatory signaling and increased cellular oxidative stress. Glycated albumin (GA), an Amadori-modified early glycation product, intensifies inflammatory reaction and is associated with coronary artery disease in patients with diabetes [16–18]. In contrast, endogenous secretory RAGE (esRAGE), a novel splice variant carrying extracellular domains of RAGE but lacking transmembrane and cytoplasmic domains, acts as a protective factor for vascular function by antagonizing RAGE signaling via binding ligands including AGEs . In this study, we sought to evaluate the association of increased GA and decreased esRAGE levels in serum with the incidence and degree of negative coronary artery remodeling in type 2 diabetic patients. A total of 136 consecutive patients with type 2 diabetic mellitus who had at least one intermediate lesion (visually ascertained luminal diameter narrowing from 50 to 70% based on angiography) in a non-PCI major epicardial coronary artery from Shanghai Rui Jin Hospital PCI Outcome program between June 2009 and August 2010 were screened. Although the culprit lesions (diameter stenosis > 70%) absolutely represent disease status of patients, they had to be excluded from this study. The use of balloon to pre-dilate the culprit lesions might change the morphology of plaque and the pattern of lesion remodeling if IVUS catheter could not pass the lesions with severe stenosis. The diagnosis of type 2 diabetes mellitus (T2DM) was made according to the criteria of American Diabetes Association (symptoms of diabetes with casual plasma glucose concentration ≥ 200 mg/dl [11.1 mmol/l] or fasting blood glucose (FBG) ≥ 126 mg/dl [7.0 mmol/l], 2 h postprandial glucose (2 h PG) ≥ 200 mg/dl [11.1 mmol/l] during an oral glucose tolerance test, and currently or previously treated with insulin and/or oral hypoglycemic agents) . Hyperlipidemia was diagnosed in patients with total cholesterol levels of 200 mg/dl or higher and/or low-density lipoprotein (LDL) cholesterol levels of 130 mg/dl or higher and/or triglyceride values of 150 mg/dl or higher and/or high-density lipoprotein (HDL) cholesterol levels below 40 mg/dl or in patients with a present history of anti-hyperlipidemia drug use . For the purpose of the study, we excluded these lesions with non-uniform rotational distortion which may cause IVUS artifacts, severely calcified lesions (arc of calcium > 90°) and ostial lesions. The study protocol was approved by hospital Ethics Committee and all patients provided written informed consent. IVUS imaging was performed after intracoronary administration of nitroglycerin (200 µg) with a motorized transducer pullback system and a commercial scanner (Galaxy or iLab; Boston Scientific, Natick, Massachusetts, USA) consisting of a rotating 30 or 40-MHz transducer. The ultrasound catheter was advanced 10 mm distal to the lesion, and transducer was withdrawn at 0.5 mm/s back at least 10 mm beyond the lesion or to the aorto-ostial junction. All real-time images were recorded on 0.5-inch discs for subsequent analysis. IVUS imaging analysis was made by a single cardiologist (R.D. ); the adequacy of the images was determined before unblinding the data for analysis. The target lesion and both proximal and distal reference segments were chosen for quantitative assessment. The lesion site was the image slice with smallest lumen cross-sectional area (CSA). The proximal and distal reference segments were most normal-looking segments with largest lumen and smallest plaque burden within 10 mm proximal and distal to the lesion with no major intervening branches. For each image slice, external elastic membrane (EEM) and lumen CSA were determined with planimetry software (QIvus, Medis, Netherlands). Plaque and media (P&M) CSA was calculated as EEM CSA minus lumen CSA. Plaque burden was calculated as EEM CSA divided by P&M CSA [22, 23]. Remodeling index (RI) was defined as lesion EEM CSA divided by mean reference EEM CSA (the average of the proximal and distal reference segments). Positive remodeling was defined as an RI > 1.05; intermediate remodeling was defined as an RI between 0.95 and 1.05; and negative remodeling as an RI < 0.95  (Fig. 1). The lesions were classified into two groups according to the RI: negative remodeling (NR) group with RI < 0.95 ; and intermediate or positive remodeling (IR/PR) group with RI ≥ 0.95. Plaque composition was defined as soft, hard, or calcified according to the acoustic signal that arises from plaque in IVUS, following previously described guidelines . At the lesion site, maximal and minimal thickness of the plaque was measured, and atheroma eccentricity index (EI) was calculated as maximum minus minimum plaque thickness divided by maximum plaque thickness. Concentric plaque was defined as EI < 0.5, and eccentric plaque as EI ≥ 0.5 . Blood samples were collected after overnight fasting and stored at − 80°. Plasma levels of glucose and lipid profiles including total cholesterol (TC), low-density lipoprotein cholesterol (LDL-C), high-density lipoprotein cholesterol (HDL-C), lipoprotein (a) (Lp (a)), apoprotein-A and -B (Apo-A and -B), and triglycerides (TG) were measured (HITACHI 912 Analyser, Roche Diagnostics, Germany). Serum GA levels were determined with an improved bromocresolpurple method using the lucica™ glycated albumin-L assay kit (Asahi Kasei Pharma, Japan). The linear range for this assay was 3.2–68.1% and the maximum inter-assay coefficient of variation was < 3.0%. Serum levels of esRAGE were determined by an ELISA kit (Phoenix Biotech Co, LTD, USA), which specifically measures esRAGE but not c-RAGE as detailed in protocol provided by the manufacturer. The linear range of the measurement and interassay coefficient of variation for esRAGE were 0.05–3.2 ng/mL and < 10%, respectively. Statistical analysis was performed using the SPSS statistical package, version 13.0 (SPSS Inc, USA). Continuous variables were presented as mean ± SD and compared by one-way ANOVA with post hoc analysis in two-group comparisons using Fisher PLSD or Dunnett’s T3 tests. Categorical variables were presented as frequencies and compared with Chi square test or Fisher’s exact test. The strength of association between two continuous variables was evaluated with Pearson correlation analysis or Spearman rank order correlation test, as appropriate. Using a 2-sided 5% significance level, we estimated that total 113 patients were needed with correlation coefficient of 0.3 and a statistical power of 90%. To identify independent predictors of NR, logistic regression with generalized estimating equations (GEE) method was used accounting for the within-subject correlation due to multiple lesions analyzed within the same patient. Those variables associated with RI with a P-value less than 0.05 in the univariate analysis or which were clinically relevant were entered into the multivariate model. All tests of significance were two-tailed and a P < 0.05 was considered significant. A total of 136 diabetic patients with 143 lesions were enrolled in this study. Baseline characteristics are presented in Table 1. Mean plaque burden at the lesion site was 70.96 ± 9.98%, and overall, RI was 0.96 ± 0.18. 81 lesions (56.6%) had negative remodeling (Table 2). There were no significant differences between NR group and IR/PR group with regard to parameters of proximal and distal reference vessels. The Eccentricity index was also similar in the two groups. At the culprit lesion site, NR group had smaller EEM CSA, P&M CSA and Plaque burden. No significant differences were observed in the plaque composition between the two groups (Table 2). Metabolic profiles were impaired in lesions with negative remodeling with lower levels of esRAGE and higher levels of GA, LDL-C and total cholesterol when compared with lesions with RI ≥ 0.95 (Table 3) (Fig. 2). No significant correlation of RI with clinical findings and plaque composition were found in the two groups by univariate analysis. RI positively correlated with serum level of esRAGE (r = 0.236, P = 0.005) and was inversely related to GA (r = − 0.240, P = 0.004), LDL-C (r = − 0.206, P = 0.014) and total cholesterol (r = − 0.183, P = 0.028) (Fig. 3). GEE logistic regression analysis identified esRAGE (OR 0.037; 95% CI 0.012–0.564, P = 0.021), GA (OR 1.093; 95% CI 1.013–1.179, P = 0.018) and LDL-C (OR 1.479; 95% CI 1.072–2.835, P = 0.023) as independent predictors for negative remodeling. The current study is the first to show increased GA and decreased esRAGE levels in serum aggravate RAGE- and, possibly, non-RAGE-mediated vascular damage, resulting in coronary artery negative remodeling in type 2 diabetic patients. Coronary artery remodeling, initially described by Glagov et al. , is a common adaptive vessel response during the process of atherosclerosis. The outer wall of the artery, encompassed by EEM, enlarges to accommodate the atherosclerotic plaque growth, thus the lumen size could be maintained. However, such a compensatory vascular enlargement (positive remodeling) does not usually occur, but conversely, coronary arterial shrinkage (negative remodeling) is prevalent in diabetes . In a pooled analysis of five IVUS trials, diabetic patients demonstrated a greater atheroma volume and exhibited a smaller lumen with no differences in EEM compared with non-diabetic counterparts . Likewise, negative coronary artery remodeling occurs in about 72% of lesions in the DIABETES trial . In this study, we observed that almost two-thirds of patients with type 2 diabetes developed negative coronary artery remodeling, which substantiated the concept that compensatory positive remodeling was impaired in diabetic patients, and constrictive remodeling might itself be attributed to an inability for adaptive remodeling. The mechanism that induces arterial remodeling in diabetes is likely to be complex. Positive remodeling is commonly associated with vulnerable plaque characterized by greater plaque volume, necrotic core  and thinning change of the fibrous cap . In diabetic patients, advanced plaque phenotype and further atherosclerosis progression could still be found despite lipid-lowering therapy . Worse glucose control and higher blood glucose variability were documented to independently increase lipid and decrease fibrous contents with larger plaque burden and necrotic core volume through various mechanisms [34–39]. Renal function could also contribute the effects of blood glucose fluctuations and blood levels of inflammatory cytokine concentrations on the tissue characteristics of coronary plaques in diabetic patients . In addition, increased insulin resistance (IR) was proved to be significantly associated with a higher remodeling index and positive coronary artery remodeling . The underlying pathophysiological determinants which promote impaired arterial remodeling in diabetes remain unclear. It is possible that increasing deposition of fibrous and calcific tissue in the arterial wall, in addition to impaired endothelial-dependent relaxation [42, 43], may limit vessel wall expansion with plaque accumulation. Previous studies including ours showed that serum LDL level was independently related to negative coronary artery remodeling in diabetic patients . In this study, we found that serum GA levels were elevated but serum esRAGE levels were decreased in diabetic patients with RI < 0.95. Multivariate analysis identified GA and esRAGE as independent predictors for negative remodeling. GA may reflect, to some extent, the severity of cross-link of collagen caused by AGEs in extracellular matrix. The exposure of GA of proximal tubular cells may also induce a decrease of metalloproteinase activities and an subsequent increase of secreted collagen (type I, III, and IV) [44, 45]. Non-enzymatic glycosylation of matrix proteins, especially collagen, induces protein cross-linking, which could lead to subsequent reduction in arterial elasticity . AGEs may also inhibit synthesis and activity of matrix metalloproteinases, which are central to the definition of extracellular matrix composition, structure and remodeling, by accentuating production of growth factors and cytokines (such as transforming growth factor beta) in vascular smooth muscle cells (SMCs), thus reducing the degradation of collagen and hydrolyzation of elastin . Clinical studies had documented that esRAGE and GA were significantly associated with arterial stiffness in type 2 diabetic patients  and in hemodialysis patients with type 2 diabetes . The loss of arterial elasticity impairs the ability of artery wall to expand in response to accumulation of plaque, while further progression of protein cross-linking may cause vessel shrinkage. On the other hand, AGEs may impaire the endothelium-dependent vasorelaxation by significantly reducing endothelial nitric oxide synthase (eNOS) expression level and NOS activity as well as NO availability in coronary artery endothelial cells . Furthermore, GA and decreased esRAGE independently contribute to vascular calcification [49, 50], which could reduce remodeling capacity, thus could predict subsequent decreased arterial remodeling . Taken together, these results support an independent mechanism of elevated GA and decreased esRAGE in serum contributory to negative coronary artery remodeling in diabetic patients. The relationship between negative remodeling and clinical events remain unclear. Vessel shrinkage in diabetes appeared as a late event in the development of atherosclerosis, thus appeared as the major determinant of lumen reduction during follow-up in nonsignificant stenotic plaques . In patients with acute coronary syndrome (ACS), negative lesion site remodeling was documented to be associated with unanticipated nonculprit lesion major adverse cardiac events (MACE) . However, compared with negative remodeling, culprit lesion positive remodeling in ACS was associated with a higher rate of adverse cardiac events. Acute myocardial infarction (AMI) patients with culprit lesion positive remodeling had more plaque vulnerability and higher frequency of plaque prolapse accompanied by post-procedural cardiac enzyme elevation than patients with negative remodeling . During the long term follow-up, both target lesion revascularization (TLR) and non-TLR rates were significantly higher in ACS patients with positive remodeling than in those with negative remodeling . Cardiac event-free survival was significantly lower in culprit lesion positive remodeling group than that in the IR/NR group. Culprit lesion PR, but not IR/NR, was associated with a poor long-term prognosis in patients with ACS . Circulating GA and esRAGE might be directly implicated as an independent mechanism, thus could serve as novel biomarkers in the development of coronary artery remodeling in diabetes. Previous animal studies showed that genetically engineered esRAGE and sRAGE could prevent the development of micro-  and macrovascular [56, 57] complications in diabetes. Currently available pharmacological agents were demonstrated to modulate the levels of esRAGE and sRAGE . Given their role in inadequate arterial remodeling which could promote obstructive disease, the AGE-RAGE system could become potential target for therapeutic modification in diabetic patients with coronary artery disease. Our study assessed coronary artery remodeling by comparing the lesion EEM to the reference segments at one time point, thus any conclusion about natural history of vascular remodeling of atherosclerotic plaques, during time in diabetic patients could not be drawn, and the relationship between negative remodeling and clinical events could also not be evaluated. The sample size was relatively small. 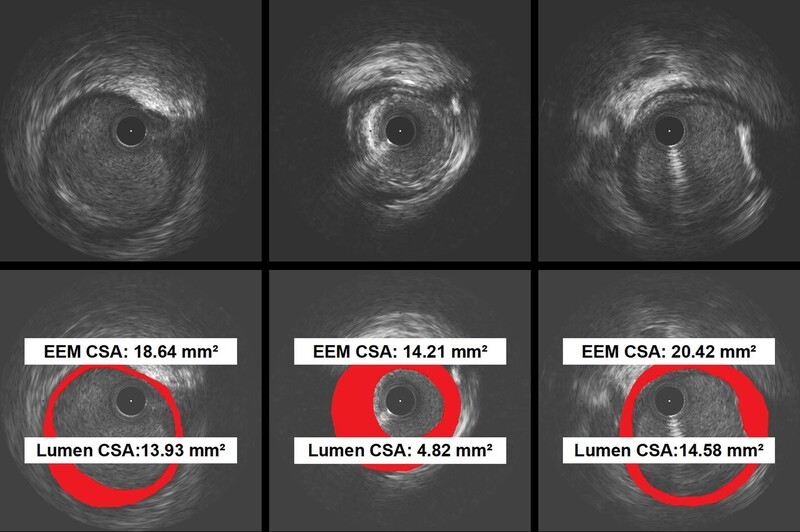 We did not examine the coronary lesions by IVUS with angiographic diameter stenosis > 70% and < 50%, so the remodeling pattern and relationship of serum levels of GA and esRAGE with remodeling status in mild and severe stenotic lesions were not known. Serum GA and esRAGE levels may vary by race [59, 60]. Our findings may also not be applicable to overtly calcified lesions, as these lesions were excluded from this study considering the unreliable measurement of EEM area. While some inaccuracy of measurement of EEM area of plaques contacting deposits of calcium could not also be ruled out. 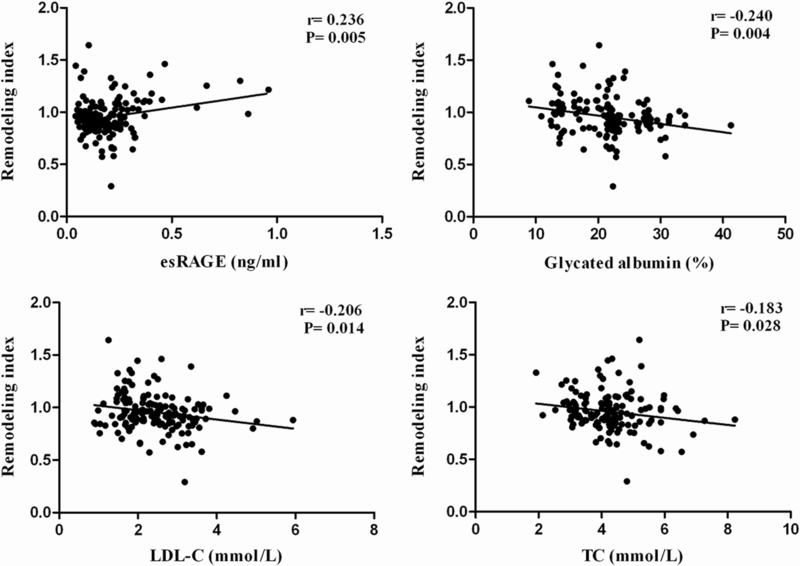 This study demonstrates an association of increased GA levels and decreased esRAGE levels in serum with negative coronary artery remodeling in patients with type 2 diabetes mellitus. RD and RYZ participated in the design, data analysis, interpretation of results and drafting the manuscript. LL and YS participated in acquisition of data and interpretation of the results. LJP, ZBZ, QZ, JH, ZKY, FHD, JSZ participated in acquisition of data. WFS participated in conception of the study, revision and final approval of the manuscript. All authors read and approved the final manuscript. The dataset supporting the conclusions of this article will not be available in a public repository because consent/approval was not obtained for the sharing of subject data from participants or the Regional Ethics Committee in Rui Jin Hospital. The study was approved by Ethics Committee in Rui Jin Hospital and informed consent for participation was obtained from all participants. This work was supported by the Shanghai Shen Kang Medical Development Foundation (SHDC1200710).